Insert the wooden sticks into the cores of the apples at the stem. Place the roasted peanuts and Smarties on separate plates. Set aside. Place the chocolate into a metal or glass bowl and set over a pan of barely simmering water. Stir frequently until melted. Remove from the heat. Dip apples into the melted chocolate, turning to coat completely. Dip or roll in the Smarties and nuts, then place on a sheet of greaseproof paper. Repeat with remaining apples. 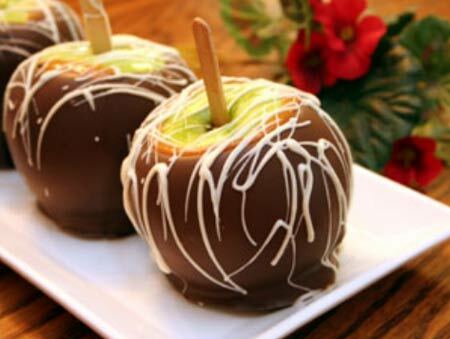 Allow apples to set at room temperature until the chocolate is firm, about 20 minutes, before serving.